The debut album of a band shows clearly their influences and also the abilities of the band. On the second aspect of their abilities, I have noticed that their first work shows a very mature character and an experience that can only be found in bands with many years of existence. As for their influences, RIFFOCITY are proud of them and show them in every composition, but also honor them by filtering them through their own musical identity. Their sound can be easily tagged as thrash metal, but this doesn’t show in detail the full aspect of it. The basis of their music is of course thrash metal as it was played in the U.S.A. According to me they bring to mind such bands as EXODUS, METALLICA and TESTAMENT, but that is not all. RIFFOCITY also love melodies and they know how to use them in order to make a song memorable. Actually they have a strong traditional power/heavy metal feeling in some songs that reminds us of IRON MAIDEN and ICED EARTH. Finally the compositions have a slight progressive orientation that makes the whole result even more interesting. Lyrically now the band deals with themes like death, vanity, politics, mythology and all these elements that define humanity. I also found really interesting and original the use of Greek lyrics in the song entitled “Arnis Oblivion”. As I said above this is a release that should definitely be expected by a more experienced band and this is impressive. It also captures the passion of a band making its first steps and above all includes compositions that will make you listen to them again and again. 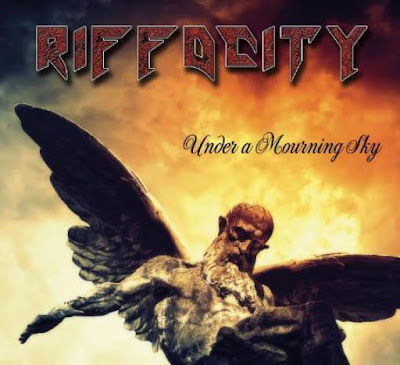 I think that RIFFOCITY introduce themselves in the global thrash metal scene in the best possible way. Now it’s up to you to check them out. Αναρτήθηκε από Nick Parastatidis στις 7:34 π.μ.